Coatepeque Caldera also known as Lago De Coatepeque (Nahuatl cōātepēc, "at the snake hill") is a volcanic caldera in El Salvador in Central America. The caldera was formed during a series of major rhyolitic explosive eruptions between about 72,000 and 57,000 years ago. Since then, basaltic cinder cones and lava flows formed near the west edge of the caldera, and six rhyodacitic lava domes have formed. The youngest dome, Cerro Pacho, formed after 8000 BC. Lake Coatepeque is located at 760 m ASL, at 53 km from San Salvador and 12 km from the city of Santa Ana, in the department of Santa Ana. The lake was formed by a series of explosive volcanic eruptions 72,000 to 57,000 years ago and by the collapse of a group of volcanoes. 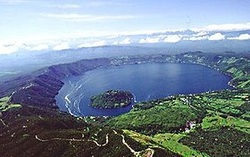 During the recorded history no other volcanic eruption has ever been recorded in the area of Lake Coatepeque. Water sports such as scuba diving and water-skiing are popularly practiced here. The old colonial church of San Pedro in downtown Coatepeque is also worth visiting. Coatepeque is a sparkling blue crater lake under the looming peaks of Cerro Verde, Izalco and Santa Ana. It's 6km wide and 120m deep, surrounded by green slopes. The lake is a popular weekend retreat for San Salvador's elite. But there are a few cheap hotels here, and during the week it is peaceful. The bus enters the northeast side of the lake to an area with hotels and public access. For around US$4 or the price of a meal, you can relax and enjoy lake access at one of the hotels.